Zotac GTX 780 AMP! Edition is the first Factory Overclocked GTX 780 over the GHZ Mark. Needless to say this is one hell of a card. Zotac has been teasing this card for quite a while and now the official announcement is here, although they have yet to reveal the pricing. The Zotac GTX 780 AMP! Will offer a decent 116% power of the stock GTX 780, all the while remaining 10 degrees cooler then the same. 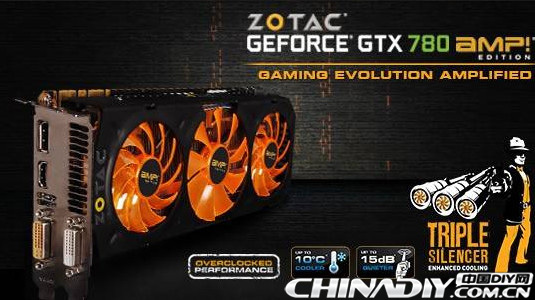 The sound output Is also quite low (only 15dba) thanks to the high performance triple-cooler the Zotac GTX 780 AMP! Edition boasts. The Specs and Pictures of the Retail box has been leaked via ChinaDiY. This card is undoubtedly an Extremely Powerful variant of the GTX 780. But how much of a difference will it make with Zotac GTX 780 AMP! Edition’s 16% difference? Not noticeable let me tell you that, unless you are into breaking world records (then the 780 Accelero Hybrid is probably a better choice) the Factory Overclock wont mean much to you. If you are lagging with a stock 780 the Zotac GTX 780 AMP! Editions Boost wont help you out much and if not then you don’t need the 16% anyways. The most viable application for the Zotac GTX 780 AMP! Edition is of course SLI, however once again if you are going for an SLI build with a GTX 780 then your gaming needs are truly colossal, Think 4k or tri monitor setups. And in that case the GTX Titan with 6GB worth of memory (the thing that really matters at high resolutions) is probably a much better choice.